There’s a reason this chili won a local chili cook-off! I’ve kept my recipe closely guarded for years, but today I’m finally spilling the beans about my award winning chili. If you asked me what my signature dish is, I would have to say it’s my beef and bean chili. I started making “my chili” about 15 years ago, and it’s consistently received rave reviews from family and friends. 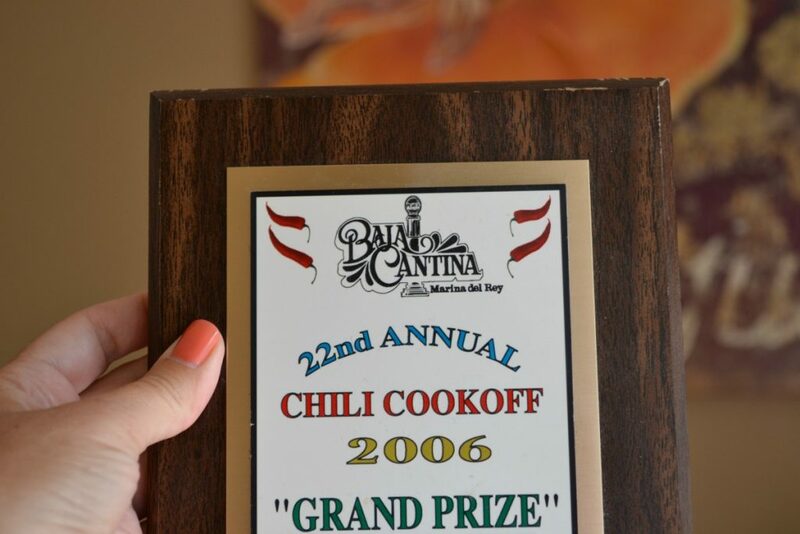 It even won 1st place in a local chili cook-off, for which I received a lovely prize of a bottle of tequila, a plaque, and our team name permanently added to the walls of Baja Cantina in Marina del Rey, California. For years I kept my recipe closely guarded, holding onto the dream that I might one day enter one of those big chili cook-offs where you can win actual money and other exciting prizes. But…since nearly 10 years have passed and I’ve yet to do so, it’s time to share my secrets. When I’m making this chili recipe on a lazy Sunday afternoon, I like to experiment and take my time. I’ll often use sauteed onions, diced garlic, roasted peppers, fresh jalapenos, and a variety of spices and seasonings. I’ll let it simmer on the stovetop for hours, stirring, tasting, adding a pinch of this and a dash of that, and letting the flavors mingle until we’re ready to eat. But I don’t always have the time or patience for that. Sometimes I just want to make a batch of chili on a chilly Tuesday night. And that is the recipe I’m sharing today. 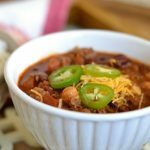 This chili recipe can go from stovetop to dinner table in 30 minutes, and uses basic ingredients that you can keep stored in your pantry. I originally used only kidney beans in the chili, but one day I forgot to buy them and resorted to using garbanzos from my pantry as a substitute. 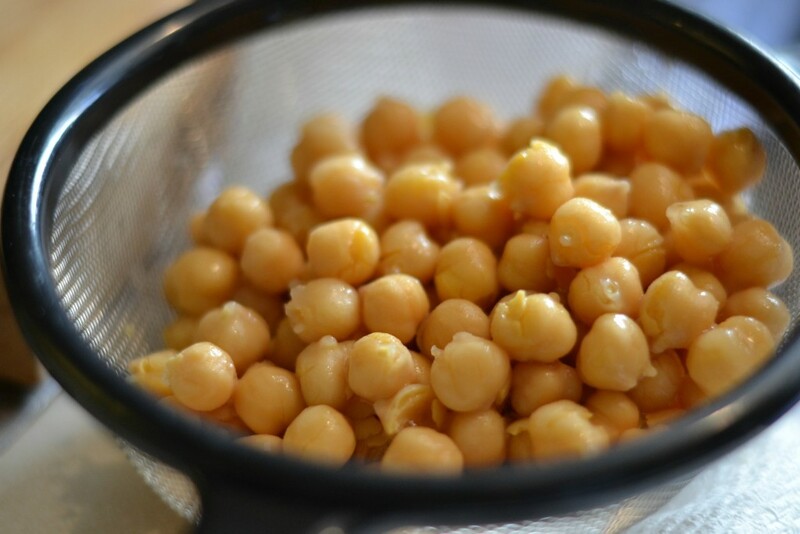 We were immediately hooked, and I’ve been using a combination of kidney beans and garbanzos ever since. The garbanzo beans don’t really add anything to the flavor of the chili, but they add a texture that’s uniquely satisfying, especially when combined with white rice and shredded cheese, which is how we insist on eating it at our house. 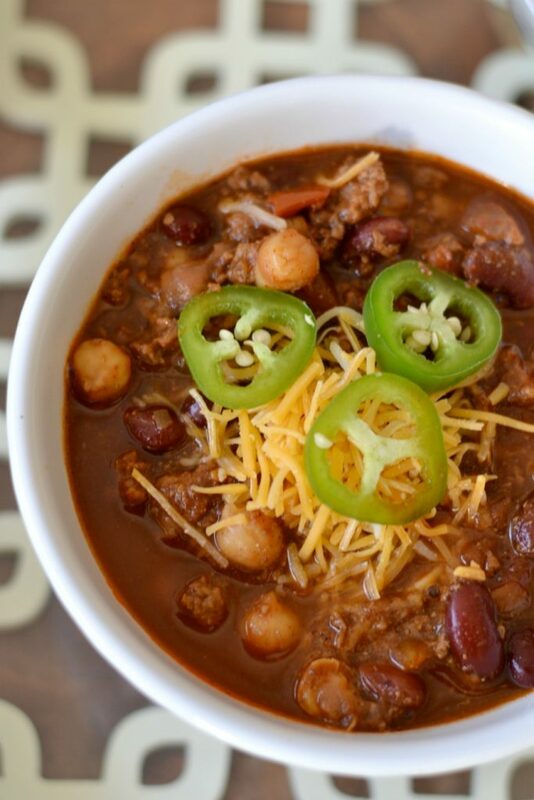 If you love chili, I am confident you’ll love this recipe. And if you win any chili cook-offs with it, you totally owe me a bottle of tequila. I like my chili fairly salty, so I add about one additional teaspoon in addition to what I included in the recipe. If you don’t like things salty or you need to limit your salt for health reasons, add the salt little by little until you get it just right. The type of chili powder you use may affect the overall heat and flavor of the chili. I’m not partial to any particular brand, but I used McCormick in this recipe. If you like your chili spicy, my favorite way to heat it up is to use chipotle powder. If you prefer it more mild, just leave it out. If you can’t find chipotle powder, you can always add a little bit of cayenne or red pepper flakes instead. 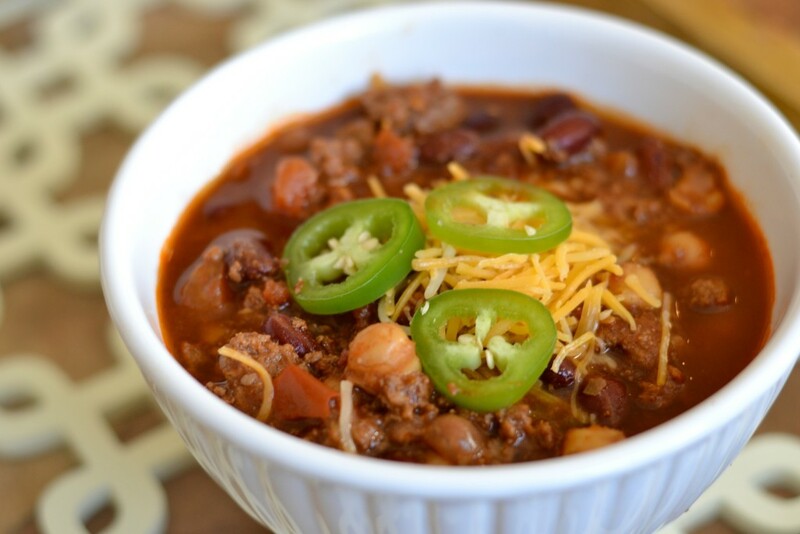 My award-winning chili recipe, simplified for easy weeknight cooking. 1 tsp chipotle powder only if you like it spicy!! Brown ground beef in a soup pot over medium heat. Drain any fat. Add all other ingredients. Bring to a boil and then reduce heat to a slight simmer. Simmer for 20 minutes or until ready to serve (the longer you simmer the more it will thicken). Serve over white rice and top with shredded cheese. Optional toppings and add-ins include: fresh cilantro, red onion, sliced fresh jalapeno or pickled jalapenos. « What Can You Let Go Of This Year? Tried this receipe, it was great! I added a bit of jalapeño peppers as I like it hot. Never have i ever added beef broth, it sure added to the flavor. Best receipe I have tried, thank you! Five thumbs up! One thing I will never try again is that award winning recipe. Way too much chili and cumin. Give me Betty Crocker recipe any day of the week. I’m sorry you weren’t a fan. We love the bold flavors, but I guess it’s not for everyone. Fortunately most people seem to love it!